The Baroque period in art history spans from about 1600 to 1775 and is one of the most versatile amongst the art eras. The name is derived from a Portuguese jewelers term “barrocco”, meaning “irregularly formed pearl”. It was preceded by the renaissance and succeeded by the neoclassicism style. The early days of what we consider baroque show a large overlap with the renaissance with some very stylistic changes, both subtle and dramatic. Many influences started during the mid 16th century and differentiating early baroque works of art from the renaissance can be very difficult. This is especially true for jewelry. As baroque and renaissance are style names, a typical renaissance item can easily be created in the 17th century. The large art centers in Europe will usually follow fashion at rapid pace, yet this is not always true for more rural areas where taste can be conservative. Ecclesiastical artifacts were commonly also crafted in traditional designs. The baroque can be distinguished from the renaissance by many characteristics but the main elements are arguably its strive for realism, drama and a strong suggestion of movement. 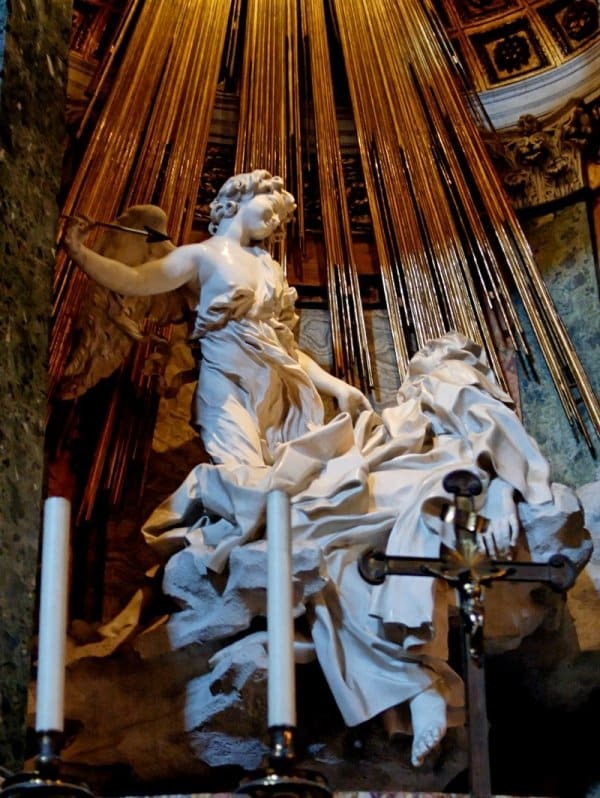 This all can be seen best in Gianlorenzo Bernini’s sculpture of St. Theresa in ecstasy which was completed around 1650. Although one can argue about the philosophical meaning of “real”, the statue is worked with great attention to detail and proportion. The diagonal lines which move in and out of the viewers plane create a strong suggestion of movement. One can easily empathize with St. Theresa’s suffering and the whole image seems to be a frozen picture at the defining moment of the story it represents (St. Theresa’s wish to end her pain by the hand of a seraph). It leaves little imagination to the viewer on what is coming next. The use of shadows adds greatly to the drama of the depiction, something that is also used in the late renaissance paintings by Caravaggio and baroque works of Rembrandt where it became known as tenebrism and clair-obscur. Some 100 years earlier, around 1550, Michelangelo created a pieta statue which is commonly known as “The deposition”. The body of Christ weighs heavily in the arms of Nicodemus, Mary Magdalene, and Mary and they struggle not to let him fall to the ground. Here also the suggestion of movement is present, but not as strong as in the works of the baroque. The faces show little emotion as if they accepted their fates, this is in great contrast to the love of the later artists of creating pathetic and dramatic images. Michelangelo was one of the precursors of the baroque. One can not talk about the baroque era without putting it in a religious context as it had such a large impact on the centuries following the Reformation. During the Renaissance and late middle ages, the mindset changed from accepting religious doctrines to trusting one’s own observations (Humanism). In the early 16th century, Martin Luther tried to reform the Catholic Church from the inside as a protest to the exorbitant lifestyles of the many clergies. At that time these people of the Church were heavily engaged in vices which we would not associate them with these days. Luther heavily protested against the sale of the so-called indulgences to pardon sinners and the role of the Pope in theology as he found that the Bible itself should be taken as the true word of God and not the word of the Church. The Roman Catholic Church had much to lose if they gave up their absolute power and a reaction soon followed. While it was not Luther’s intention to separate from the Catholic Church, the involved parties soon became divided into two main camps; the Protestants and the Catholics. Other Protestant reformers also started forming own doctrines with varying explanations of the Scripture. Most notably Zwingli and Calvin had very strong opinions on idolatry and their iconoclastic views had a strong influence on the arts. This can be seen in the differences between southern and northern European Baroque. The counter-reformation by the Catholic Church in Rome promoted idolatry as a means of devotion. Not only the Catholic Church became divided, the European rulers also took sides in this matter due to various reasons. Europe became divided in countries which were mainly Catholic and those where Protestantism gained a strong foothold in the late 16th century. Long lasting wars were fought out between the two camps. King Philip II of Spain was sovereign of most of the low countries and as a devoted Catholic he did not tolerate the Protestant communities which established themselves on his soil, nor did he have much compassion for the rebellious noblemen who pleaded for more religious and governmental autonomy. When many religious statues were destroyed after Calvinistic preachers called for the destruction of all idolatry, Philip sent an army to the low countries which resulted in the 80 years war between Spain and the 17 provinces. Meanwhile in France and the Holy Roman Empire (which was made up of fragmented central European states, mainly present day Germany, Austria and Hungary) the rulers decided on some religious freedom through the The peace of Augsburg in the Holy Roman Empire and the Edict of Nantes in France (the revocation of the latter played another critical role in the development of the baroque). Although there was some religious tolerance at the time, there were still tensions between the different sectarian states, also fueled by dynastic power struggles. Eventually, all this tension accumulated in the 30 years war in which most European nations were involved. The 30 years and the 80 years wars ended with the Treaty of Munster in 1648 and new boundaries were established, reshaping the map of Europe. Philip lost most of the low countries in favor of the Protestant Dutch Republic. The southern part of the former 17 provinces remained under the rule of the Spanish Habsburgs and became known as the Spanish Netherlands which remained mainly Catholic. Although the southern and northern parts were reunited later, one can still taste the main differences in mindsets between these two parts today. Two parties came out strongest, the French and the Dutch. The Dutch were destined to rule the seas in the 17th century, while France became the center of the arts. In England, Protestantism was established by the formation of the Anglican Church after Pope Clement VII refused the annulment of Henry VIII his marriage to Catherine of Aragon. One can arguably divide the baroque era into two categories. The first is based on region (religion) and the other on time. Due to the main differences between Catholic and Protestant doctrines – in particular, idolatry vs. iconoclasm – we could make a difference between countries with a mainly Catholic and those with a dominant Protestant population. Although the Lutheran Church did not promote iconoclasm, other denominations did and especially the Calvinistic communities were strong advocates of that. The followers of Calvin were very well represented in The Netherlands, Germany, England and France (where they were known as Huguenots) and as idolatry was not permitted in some Protestant doctrines – and sobriety was heavily promoted – the style in these countries was much less colorful and elaborate as in the countries of the counter-reformation (Spain, Italy and also France) which tried to show abundance of both power as devotion. Germany consisted of many spread out states and through the “Peace of Augsburg” the rulers could determine themselves which denomination became the “national” one, but they had a dominant taste for heavily decorated items. We could also divide the baroque period into three main periods according to the evolution of the style while neglecting regional differences. There is no cut-off date to separate the renaissance from the baroque period, instead, it was a logical continuation. Some scholars mark 1600 as the start of the baroque, while others use 1620 as the cut-off. One can however not get past the fact that there was a fluency between these two styles. Typical baroque works were created in the 16th century while typical renaissance items were created well into the 17th century. Using other peoples designs, and building upon it was considered a virtue during the Renaissance. This changed in the 17th century. Around 1600 a new ornament was developed at the court of the Holy Roman Emperor Rudolph II in Prague, the ear shell or auricular motive. This c-shaped ornament became one of the defining ornaments in the high baroque ornamental language. Especially in the northern European areas as The Netherlands and Germany this evolved into, mainly silver, artifacts that showed a bone character and later even evolved into fluent moving items that showed the malleability of silver (and gold), making these fleshy items look like they were crafted from wax. Paulus van Vianen was one of the primary artists of this auricular style. As in architecture and sculpture, ornament and shape merged. The ornament was no longer supporting the artifact, instead it defined it. Around 1650 another style was well established in northern Europe, the “floral style” in which naturalistic flowers were embossed to cover the whole of the material. In France the acanthus leave (often stylished) became an important motive. The French baroque can be distinguished from most other European countries by the more classical themes and a higher refinement of delicate ornamentation. In the latter part of the 17th century, the French King Louis XIV (the “Sun King”) moved the royal court from Paris to Versailles, just west of Paris. The palace of Versailles was rebuilt under the oversight of “art-director” Charles Le Brun, who created the most impressive palace in Europe according to the new design language created by Jean Berain. Interior and exterior, as well as the gardens, were created in a homogeneous style which became known as the Louis XIV style. The auricular motive was reworked in C-shaped volutes, scroll motives were decorated with stylised floral-foliage. France was one of the most powerful nations in Europe and the palace at Versailles left friend and fiend in awe of the splendor and the expression of power the palace represented. Shortly after the palace became the official residence of the King (in 1682), Louis in 1685 revoked the “Edict of Nantes” which was established to create freedom of religion in France. The Protestant community began being prosecuted and many had to flee to neighboring countries. Among them was a large group of “Huguenots” (French Calvinists) which surprisingly had a vast number of designers and other craftsmen in its community. As they found shelter in the countries of the Reformation, they brought the new Louis XIV style to their countries of refuge and this style was soon adopted in the whole of Europe. Daniel Marot, who worked with Berain at Versailles, found refuge in the Dutch Republic and the Prince of Orange soon became enchanted by his designs. When the Prince later became King William III of England, the style was adopted there as well. Not only craftsmen from the major fashion capital Paris fled France in the late 17th century, but also many gold and silversmiths from more rural areas. These craftsmen worked in a less decorative manner and the items they produced were more sober, although the Louis XIV style was still clearly visible by the symmetry and the use of C-shaped concave and convex outlines. In England, this style became known as the “William and Mary style” and is in contrast to the heavily decorated items produced in the German areas. When Louis XIV died in 1715, his heir (Louis XV) was only 5 years old and France was ruled by Philippe, Duke of Orleans until 1723 when the new King became of majority (at age 13). 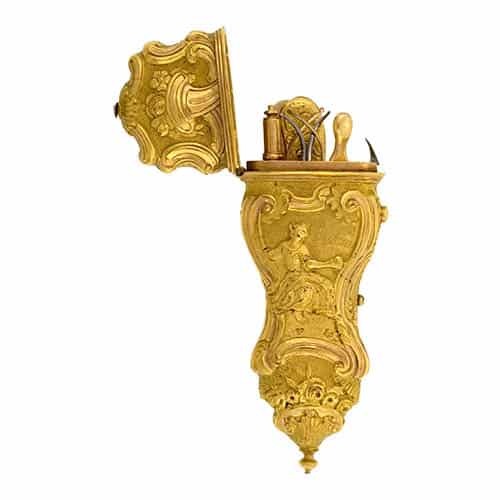 During the regency of the Duke, the style remained Louis XIV but some ornaments were worked open by sawing and piercing, giving it a lighter appearance. This period is termed the Regence and should not be confused with the 19th century Regency in England. When Louis XV of France in 1726 appointed Juste-Aurèle Meissonnier to the post of royal designer, the static and classical Louis XIV style was largely replaced by a more frivolous ornamental language with flowing lines and endless movements. While under the rule of Louis XIV the ornaments supported the design, during the rococo the design was typically the ornament. Lines broke out of the overall shape or the shapes were one twist of lines in relief. The total symmetry was abanded and gave way to movements in all directions, creating the asymmetry that is so typical for this period. Shell motives were turned and foliage designs became more realistic. The name rococo is derived from rocaille, a decoration design which can best be described as a rocky surface and it is one of the many new designs used during the rococo. This style also was spread throughout Europe as Paris remained the fashion capital of the world. On the European mainland, this rococo was named Louis XV style although the designs were not set at the King’s court. Rather everyone employed its own interpretation of this style. In the English territories, this style is often named early Georgian. The successor of this style was the neoclassicism. During the roughly 150 year timespan of the Baroque period, many different styles of jewelry have been created. Not only do they differ by period, but there are some regional differences as well. Due to international trade and colonization (but also piracy) wealth expanded in many European countries and this increased richness of the middle to upper classes lead to an increase in jewelry production. Jewelry from this period is less scarce as from preceding periods, although many jewelry items still found their way to the melting pot once there was a change in fashion and the gemstones and jewelry had to be reworked into the new craze of the day. Throughout the period there was no shortage of precious metals or diamonds due to the discoveries of gold and silver mines in South-America and the sea routes to the famous Golconda diamond mines in India. Although the latter mine dried out in the late 17th century, its role as major diamond producer was soon taken over by the diamond mines in Brazil which were discovered in 1723. These mines were under the control of the Portuguese and it brought enormous prosperity to that part of the Iberian Peninsula. In the early Renaissance, the influence on jewelry was mainly still manneristic with its emailles en ronde bosse and mythical creatures. In the Catholic countries, religious depictions were amongst the favorite jewelry items. The horticultural style was very popular in the states of the Holy Roman Empire. Pearl necklaces were worn as a single strand, close to the neck and many pearl earrings were worn as drops. From around 1630 the miniature French enamels by Jean Toutin and his sons Henry and Jean II became the fashion for watch cases and pendants. Towards the end of the 17th century the bow-knot design came into fashion through designs of the French court jeweler Gilles Légaré – named sevigne when worn as a pectoral brooch – as well as girandoles, which remained popular throughout the 18th century. The invention of strass added to the love for gemstone set jewelry. Throughout the period diamonds and other gemstones were set in closed settings which were usually foiled. With the invention of the rolling mill around 1750, it was possible to create more uniform sheets of precious metal and many designs could be more easily sawn out, creating more open worked jewelry and silverware.